After living for 5 years in Canada with three different employers and at least five work permit renewals, I finally got the permanent resident in Canada for me and my family. I will describe in this article how I did it and I will share some few tips. Please remember I am going to write what to do, not how to do it. I will also describe my specific case, which it will be useful for those who have a similar scenario. Please do not send me questions regarding how to do things or what if you have another profession different than mine, I will just ignore those comments. NOC 2171 which it fits as a NAFTA profession. The profession is not regulated in Canada. Appling under Canadian Experience Class. Read, read read. All information is on the CIC website. You can always call the CIC call centre for any doubt. When I did this, of course as anyone, it was my first permanent residence process. So, as I was not having any previous knowledge, I didn't do many things in parallel, which it could save me some time. 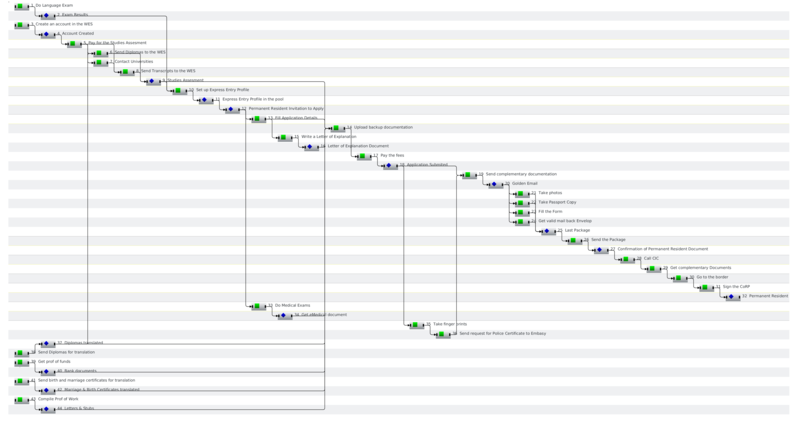 Here it is my Gantt diagram. You can download the source as well. I put some comments on each item. Numbers are not in order, they correspond to the task id from the Gantt chart. Doing the language exam is a MUST. Personally speaking, I tried first IETLS, but it is harder to get a good score there than CELPIP. Sadly, CELPIP abroad availability is not good. You will get your score by mail. The physical paper in terms of Express Entry is not important, keep note of the data it is there. CIC agents have an electronic way to verify it. This exam can help you in other things, it is not limited to migration matters. Go to the WES website and create an account. Once you have the WES account, look for the credential assessment. Pay for your Canadian assessment. You will get directions what to do. Scan, Copy and Print your title diplomas and send them to the WES. Contact each university of any title you are claiming, explain to them what you want to do and send them the signed form from WES. Some universities will send the transcripts in English directly to the WES, others will send you the transcripts to you (with an official envelope) and you will need to send that to WES without any sign of manipulation. The key here is they see it has not been tainted. In my case, the ITAM and the FAR sent the transcripts directly, but the SudParis sent me a copy with an official envelope, I just put all inside that envelop and I put a bigger envelope and sent that to the WES. You will get your assessment by regular mail. Again, the physical paper is not important for the CIC, it is the numbers there. CIC agents have a way to verify it electronically. This assessment is very handy if you want to do some studies later in Canada. Answer the many questions in the CIC Express Entry website and set up your profile. You will get your Express Entry score and a notification you are in the pool. The way starts. Eventually, you will get a notification inviting you to apply. From this point, you are running against the clock. CIC gives you up to 60 days to finish your application. The application form will be half-completed with information from the Express Entry profile. But now, you will need to set up more information. Start remembering for the last ten years: your address history, your work history, any voyages you have done, etc. You will need it. Start looking for any document you can use to back up any claim you do in the questionary and the forms you will fill. There is a place in the system to upload it. You will need to master any PDF generator program, as I remember, there is only one space for studies, so you will need to generate a big PDF with all data. The same for other backup documents. The system will give you any direct link to download all the PDF forms the CIC will need for your application. Write a Letter of Explanation to the evaluating agent. This letter is a good opportunity to transmit any feeling, pertinent data it is not asked in the forms but it is more important you explain here if you were not able to get one supporting document. For example, say the case you did not meet your biological father or a company that refused to give you the referral letter. Upload your letter, again in PDF format. Pay on the website with your credit card. Your application is submitted, just wait for any communication from CIC. Eventually, you will get some extra request, one of them is the police certificate from your country. You will need to read about how Canada has agreed with your country about that. Do not worry, all is on the CIC website. The golden email has arrived. This means you are approved, but not yet resident. This emails has some directions, read them very carefully. Take more photos of you and your family members. In short, these are passport photos. Take a copy of the biodata page of your passport. Mexicans do not require a visa, a copy is enough. Citizens from other countries may need to send the original password. Get a prepaid way to get your documentation back. The golden email has accurate directions about the valid mail services you can use. Send the package to the address specified in the golden email. 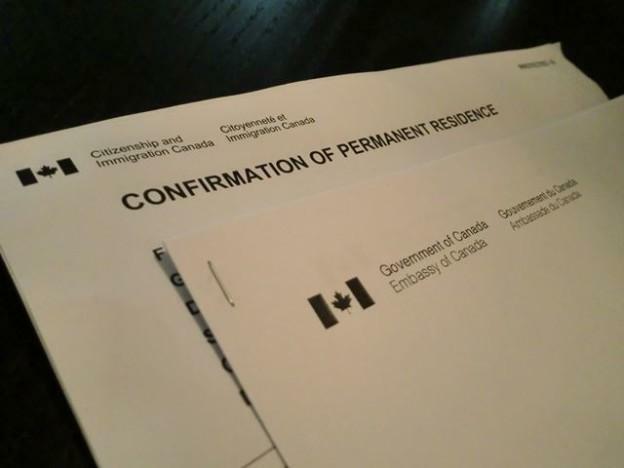 You will get by mail your Confirmation of Permanent Resident. You have been approved but not yet a permanent resident. This document has your last directions, read it very carefully. Call the CIC to get an appointment. They will explain you your options. If you are already in Canada where you can go without going out of the country. Get your complementary documents, some of them are your original passport, proof of address if you are already in Canada, any CIC previous document you may still have. In my case, I took the call of going to the border. As I live in Ottawa, I was told that CIC only accept CoRP signatures every second and fourth Tuesday of each month without an appointment, first arrived first served. Two days for a whole city would be insane. The key here when going to the border is getting the refuse paper from the US. The US agents know already what you want to do, you just need to tell them you want to get back to the Canada Border Services Agency spot. You must get that paper, Canadian agents will refuse to give you service if you do not show that paper. The agent still needs to meet physically all the applicants regardless their age. You and any family member older than 14 years will sign the CoRP.
You will need to look for an authorized medical centre for the health check. The price varies depending on the spot, so if you have more than one option call all of them. You will get an eMedical form from the medical centre. Keep it, you will need that. Look for an authorized place for your fingerprints to be taken. Usually, the police station would be a good option. In the very specific case of Mexico, I needed to send my original fingerprints with a request letter directly to the Canadian Embassy in Mexico. They will request for my police certificate on my behalf. Scan your original studies transcript with your official translation. Get a certified translator for this. Only official translator's work is valid for the government of Canada. Canada requires you to show you have funds when landing to Canad and that you do not have big debts as well. CIC will require you show you have that money saved for a least six months, so you can not borrow someone, print the statement and return the money. The quantity of how much you need to have is based on the number of your family members. I had to show at least 26000 CAD for four family members. Go to the bank and ask them to print the bank statements. This paper must use a head letter and must have the bank seal. Scan your original and translated birth and marriage certificates. Dig in your work history and ask your ex-employers for a reference letter. The reference letter only needs to say you really worked for them in the position you claim. In my case, I had six employers in the last ten years. So, I contacted each one. As a tip, make this easy for them. Write the letter yourself, send it as a PDF to them, ask them to sign it and send you back scanned by email. The latter must be using the company head letter and signed by someone with authority. It can be your immediate boss, not necessarily the owner of the company. If it happens you still have stubs or checks, include them, they are valid. Any missing reference can be explained in the Letter of Explanation. I was lucky, I got the letters for my old jobs from Mexico, but I have read that some people are not that lucky; I have read some success stories of people showing reference letters from co-workers supporting the work claim. Create one PDF document per each work you are claiming. The CIC will ask you for your home history for the last ten years or since you are eight-teen, whatever is the longest. CIC does not really ask for any evidence. However, it is a good idea to talk to them in case CIC calls. Please note you should NOT leave any blank space in your timeline. The CIC will ask you about your work history. For each claim you do, you must show evidence; some ways are a letter explaining in detail your past job, stubs are valid as well. Canadian jobs are easier to show, if you were laid off the RoE is a good proof of work (with stubs of course). T4 lips are not enough by themselves. The CIC will ask you for education records, although you already sent your ECA you must send a photocopy of your title and transcript (grades), both in the original language and translated by a certified translator. If you can ask directly your school to give you a transcript copy in English or French, you may save that money. The CIC accepts foreign papers in English or French. Professional or product certifications are not considered education, even if they are work-related. Do not deny your spouse! Sometimes applying you alone will give you about 5% more points. Try always to apply with her/him. Bringing later your spouse is possible, not impossible, but it is a slow process. You may bein a distant-relationship for about two years or more (and airplane tickets are not always cheap). If you are coming from a non-visa country, your spouse could visit you on a regular basis. This is harder if you have children. Don't be an idiot and don't deny your spouse! Claiming to be single automatically bans your spouse and children as CIC compares your family member declarations with past processes. The Letter of Explanation is your friend. This is the document you can use to explain the agent why you miss a paper, or why your application is missing a field. For example, if you do not know your father, and only know his name. This is a place to explain that you only know his name and why you kept empty the other fields. Another example is a missing employment record. Some employers are not cool as you wish. Using this letter to explain why you have incomplete evidence is a good use of your time. I want to thank all those who support me. Especially, I want to thank to miss Jessica Thibault who has supported me and helped me without any personal gain.